LACHUTE, March 25th 2019 – RV² Technologies (a subsidiary of Groupe SiliCycle) and Tricentris, two leaders in their respective fields, are proud to announce today the signing of a partnership for the transformation of used glass in Quebec. This new agreement totals $ 100 million over a 20-year period, during which Tricentris will supply RV² Technologies with 30,000 tonnes of glass powder annually. This alliance will be able to recycle more than 25% of all used glass issued from selective collection. 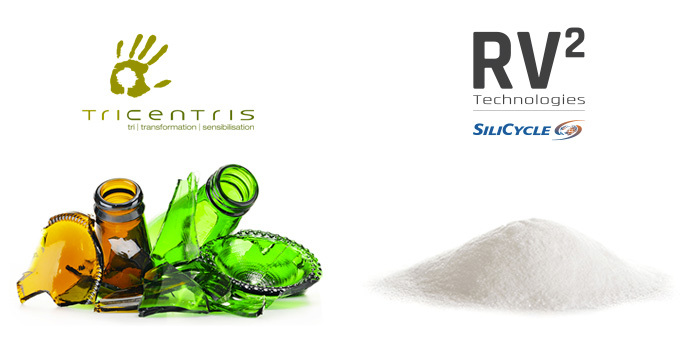 RV² Technologies innovates by transforming used glass into raw silica and high-value chemicals. Like a silica mine, Tricentris' used glass resource becomes the supply source for RV² Technologies. But rather than extracting a natural resource, it's the glass from the bins of approximately 2 million Quebecers located in Tricentris' collecting area that will serve as raw material for the production of precipitated silica. In addition to being largely preferable to mining, this technology allows the glass to be "upcycled" into a product of superior quality or utility. Precipitated silica is a material used especially in tires, paints, coatings and toothpastes. Among other things, it makes it possible to increase the strength and durability of the products in which it is used. As glass is consumed in Quebec, sorted in Quebec, packed in Quebec, recycled in Quebec and resold in Quebec, this is a good example of a circular economy. « I am very happy with the signing of this historic and essential supply agreement. The SiliCycle team is composed of many chemistry scientists who have made their studies and their career with this super material that is silica. Glass is silica. We navigate with RV² Technologies, our subsidiary, in our field of expertise and we are very proud of it. » said Hugo St-Laurent, president and CEO of SiliCycle and president of RV² Technologies. « Today's announcement is the result of almost a decade of work, born from an idea of the Quebec Industrial Research Center (CRIQ), and then taken into SiliCycle's laboratories to improve it. The Tricentris-RV² Technologies duo finally brings an innovative and even exportable environmental solution. » added Mr. Claude Pouliot, General Manager of RV² Technologies. The alliance between RV² Technologies and Tricentris is perfectly in line with the government's priorities and its commitment to the creation of new channels of recycling and opportunities, as expressed in the recent budget of the Government of Quebec. Founded in 2014, RV² Technologies is a company entirely dedicated to revaluation of used glass issued from selective collection. Turning glass powder into a high value-added material, our company is working to reintroduce it in everyday products' supply chain. Founded in 1995, SiliCycle is a world leader in the development, manufacturnig and marketing of products for chromatography, analysis and organic synthesis as well as extraction and purification of molecules from various biomasses. Collecting, sorting and selling more than 215,000 metric tons of recyclable materials each year, Tricentris is the largest sorting organization in Quebec. The company is also involved in transformation since the opening of its glass micronization plant in 2013. With pride and determination, Tricentris carries out its mission by sharing the benefits from the sale of recyclable materials and thus contributes to environmental, social and environmental aspects of regional development.